This Barcelona holiday apartment, situated in close proximity to the beaches, the bustling Las Ramblas and the Gothic Quarter, is a great choice for those making their way to the Catalan capital. By choosing this apartment, visitors are sure to enjoy easy access to all of the sights in and around Barcelona, without a hassle! This studio apartment in Barcelona can accommodate up to four people. Throughout this space, a double sofa bed as well as two single beds can be found. A simple design yet one that offers comfort makes this a great choice for families or friends visiting Barcelona. The fully equipped kitchen allows visitors to create their favorite home-cooked meals, all in the comfort and privacy of this ideal home-away-from-home. 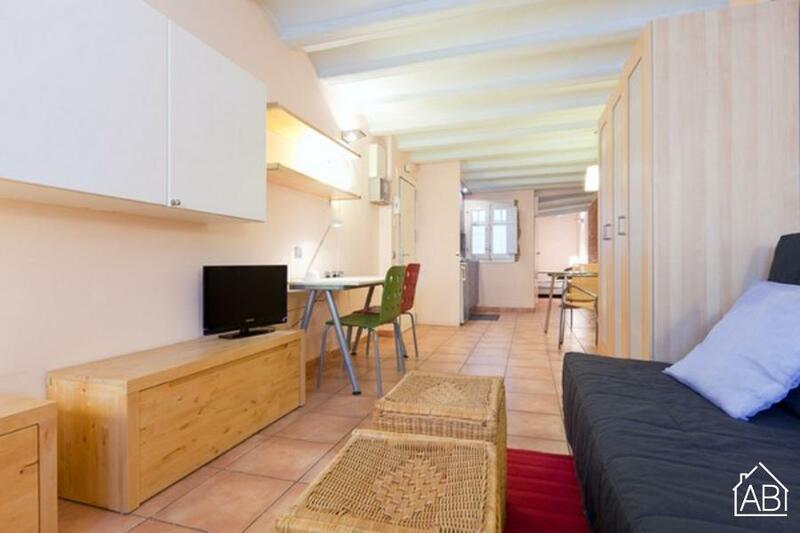 For those in search of a comfy place to call home, this holiday apartment in Barcelona is a great choice! The beautiful Born neighbourhood in Barcelona is characterised by its unique mix of historic sights, contemporary art and trendy styles, and is a must-visit on any trip to Barcelona. Situated just outside of the original city limits of El Barrio Gótico (or El Barrí Gòtic in Catalan), this town in the heart of Barcelona is home to some of the best attractions in the city. The ´barrio´ takes its name from the Catalan word ´Born´ which means, among other things, a place where tournaments take place. The area is so called as this neighbourhood was once the site of medieval jousting competitions, and the Passeig del Born is where these events were once a regular fixture. Today, this street is known as the main avenue in the neighbourhood and is packed full of cool restaurants and bars. The Born is well known for its picturesque alleys and intimate passageways dotted with hidden restaurants and one-of-a kind boutiques. The area is also home to plenty of amazing architectural gems such as the Santa María del Mar church, originally built as a beacon for sailors and fishermen in the medieval times. A visit to the famous Picasso Museum is a must when strolling around El Born, where you will find a collection of over 4000 works housed in 5 spectacular palaces, built in the 12th and 13th centuries. Just a few steps from El Born, although actually in the Sant Pere neighbourhood, you can marvel at the Palau de la Música Catalana, one of Barcelona´s most fabulous modernist buildings. The Born area is bordered by the Gothic Quarter, the Eixample district and the impressive Ciutadella Park, while remaining near to the Barcelona beaches. Its central location makes it the perfect place to rent your Barcelona apartment, allowing you to stay close to many of the city´s best attractions, while enjoying the rich history and culture of this unusual neighbourhood every day.